Note: As of March 15, a federal judge had ordered a freeze on the new travel restrictions issued by President Trump. A total of 2,466 refugees from six countries under new travel restrictions – Iran, Libya, Somalia, Sudan, Syria and Yemen – have resettled in the United States since Donald Trump became president, according to a Pew Research Center analysis of U.S. State Department data. 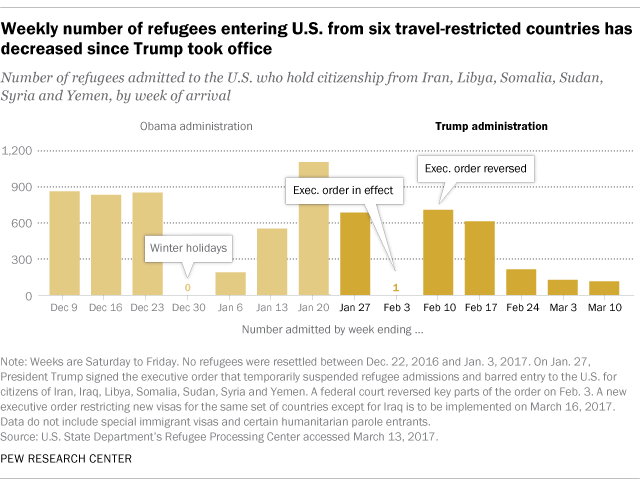 The number of refugees from the six travel-restricted countries represents 32% of all refugees who have entered the U.S. since Trump took office. Trump recently signed a new executive order, scheduled to take effect March 16, that bars new U.S. visas for 90 days for people holding citizenship from the six nations while security measures in those countries are reviewed. (A previous order that took effect Jan. 27 also barred citizens of Iraq, but parts of it were stopped by the courts.) The new order also suspends refugee admissions to the U.S. from all countries for 120 days, pending a review of security screening measures. Including refugees from countries with no travel restrictions, a total of 7,594 refugees have entered the U.S. during Trump’s first seven weeks in office (Jan. 21 to March 10). Of these refugees, 3,410 are Muslims (45%) and 3,292 are Christians (43%), with other religions or the religiously unaffiliated accounting for the rest. So far in fiscal 2017 (which began Oct. 1, 2016), refugees who hold citizenship from the six restricted countries have accounted for more than a third (34%) of 37,716 refugee admissions. No more than 12,284 additional refugees may enter the U.S. for the rest of this fiscal year under the terms of Trump’s most recent order, which lowers the annual refugee admissions ceiling to 50,000 – down from 110,000 under the Obama administration. Among the six countries identified in the order, Syria (5,585), Somalia (4,703) and Iran (1,893) are the leading nationalities of refugees who have entered the U.S. so far in fiscal 2017. A total of 595 refugees from Sudan have entered the U.S. during this time, while 18 refugees are from Yemen and three are from Libya. Before entering the U.S., refugees must be approved by the State Department’s Bureau of Population, Refugees and Migration, a process that includes screening by the State Department, the Department of Homeland Security’s U.S Citizenship and Immigration Services and other federal agencies. Once approved by the bureau, refugees undergo a health screening, and most also go through cultural orientations prior to entering the U.S. The entire process can take 18 to 24 months.